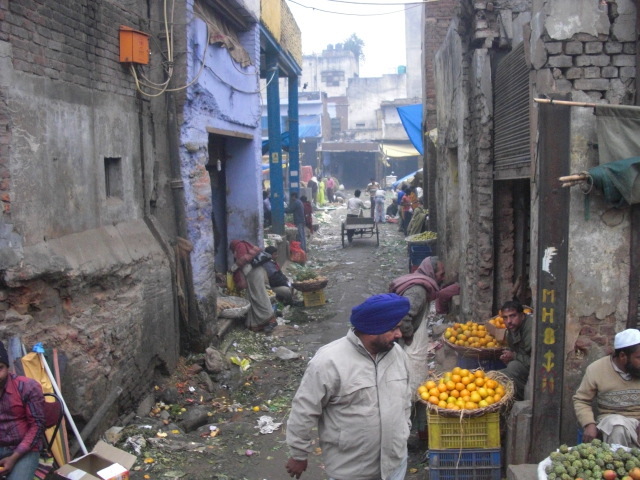 I’m in India, and I’ve been here for one full week! I can’t believe that I have been here for only a week though, because I have seen and experienced so much it’s not possible it has all happened in 7 days. 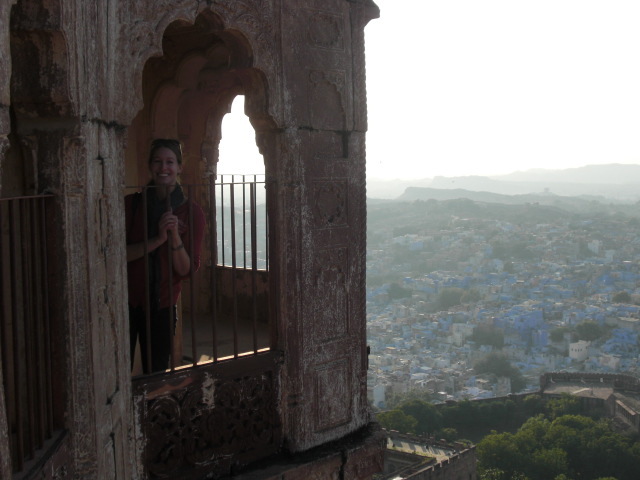 My travels here went all according to plan, except once I arrived in Delhi. I arrived after over 24 hours of travel (about 18 hours of that being on a plane) and walked to the arrivals gate where we were supposed to meet Madhu, our director. I didn’t see her there, so I waited in the lobby, as per her prior instructions. I was still waiting there about an hour later, and wondering if anyone was going to be there, and a kind gentleman approached me. He said he had noticed I had been waiting there for a long time, and said I could use his phone to call someone. I called Madhu, and apparently she had gotten the wrong flight information that I was going to be on a flight with about 6 of the other students – and their flight was delayed until 5am! She didn’t want me to take a taxi by myself, especially since the hotel was quite far from the airport – so I had to wait in the airport until the others arrived. Pulled an all nighter and waited in the airport for about 7 hours, but qu’est-ce qu’on peut faire? I passed the time by reading (and finishing) the book my parents gave me for Christmas. I was really happy to finally see the others! One of my favorite things to do here is look out the window when we’re on the bus – there is so much to see!!! I saw so much on the first ride from the airport to the hotel – one of the first things being a group of monkeys crossing the road! 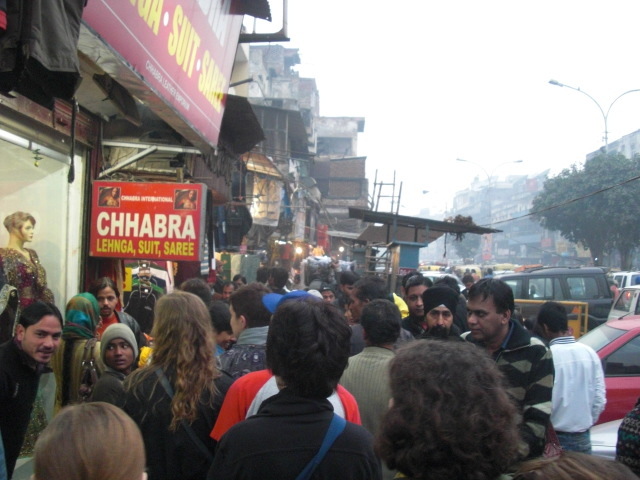 Delhi, the capital, has 12 million people there, and I have never been in a place with so many people. There are SO. MANY. PEOPLE. The roads are absolutley insane compared to home – people walking around, animals plodding along, cars honking, people selling things, eating, sleeping, peeing, hanging out. 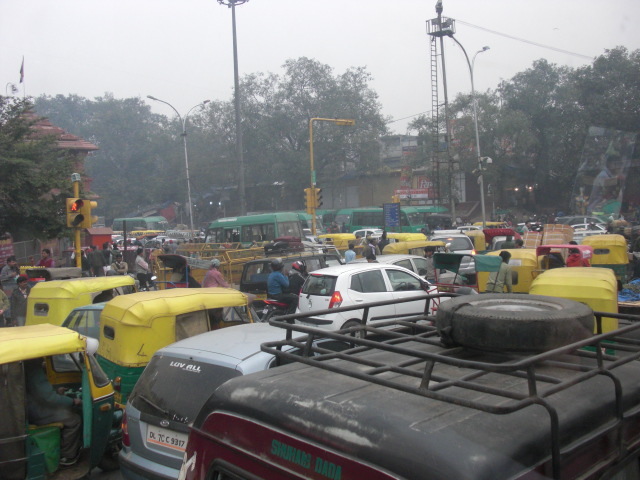 The traffic is just as crazy as it has been described, with what appears to be no rhyme or reason. 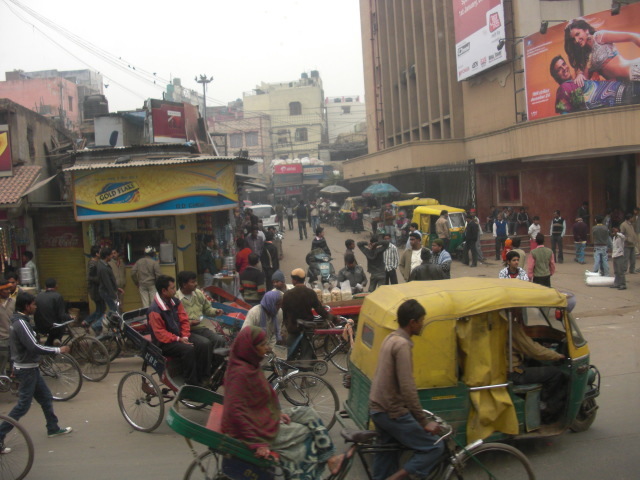 Traffic can be anything, including cars, buses, bicycles, people, animals, rickshaws, autorickshaws – basically, anything goes. The bigger you are, you get the right of way (unless you are a cow). The honking never stops – but that’s because here, you are only responsible for what’s ahead of you and not what’s behind or to the the side of you. That’s why people merge freely without checking their mirrors – and you honk if you’re coming up along the side of someone to let them know you are there. 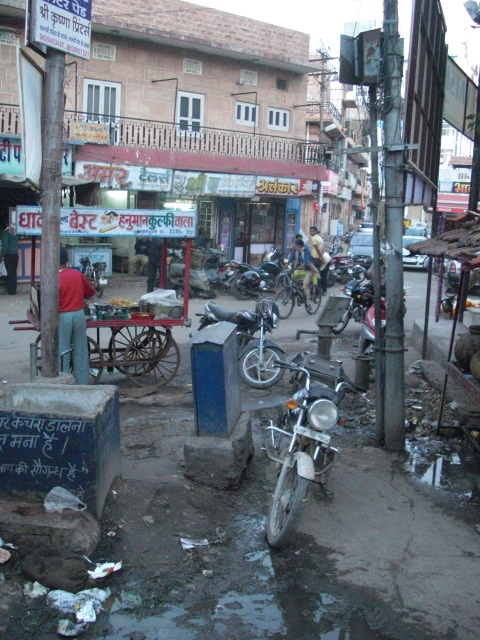 There are animals everywhere – I don’t think I have ever seen more cows or stray dogs in my life. They roam freely, no one bothers them and they won’t bother you (just watch where you step!). I’ve also seen elephants, camels, horses, goats, monkeys, and peacocks! Navigating the streets is a little stressful – but I’ve learned you just have to look ahead of where you are going and get used to not having any personal space. Delhi also has a lot of smog – so everything is covered in a haze. You can’t see clearly all the way down the road, and my snot has turned black! 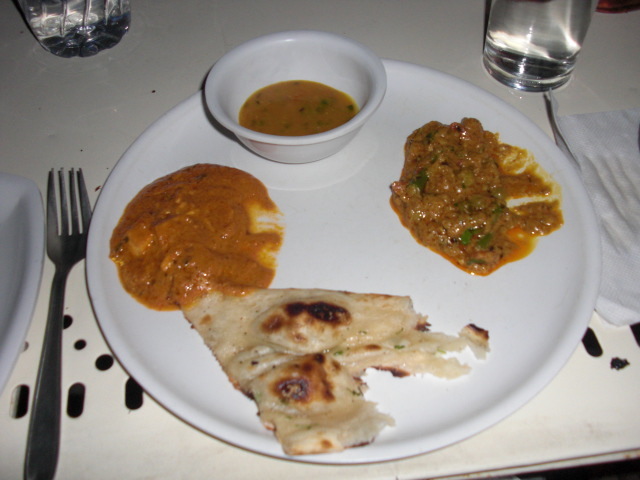 The food is quite good so far – almost everything comes in a sort of sauce, and it’s eaten with rice and a flatbread. I’ve come to expect spice in every meal, even breakfast! I haven’t really had much that was too spicy to handle, and if it is, you cool the fire with some plain yogurt. I have started to crave fruits and vegetables though, since they haven’t been as readily available and we have been on the road for the past week. I have been getting more used to standing out as an obvious foreigner (no hiding this pale skin and blonde hair!). People stare at us all the time and take pictures of us – I’ve even been asked a few times to have my picture taken with someone. We are as exotic to them as they are to us. I’m excited to buy some Indian clothes though to not stand out as obviously, and to have some clothes that are more suited to this weather. It hasn’t been very hot yet (60s-70s), but it would be nice to have something a little more breathable than jeans. We’ve been traveling around a lot before we arrive in Kolkata on Friday. 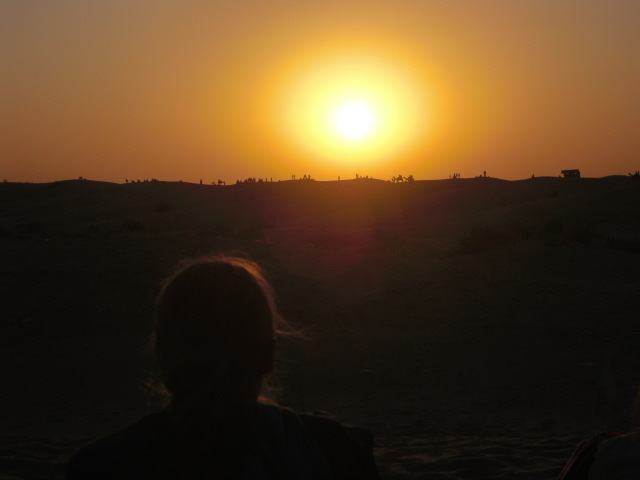 We spent the first couple days in Delhi, and then went to the region of Rajasthan and visited the cities of Jodhpur and Jaisalmer. 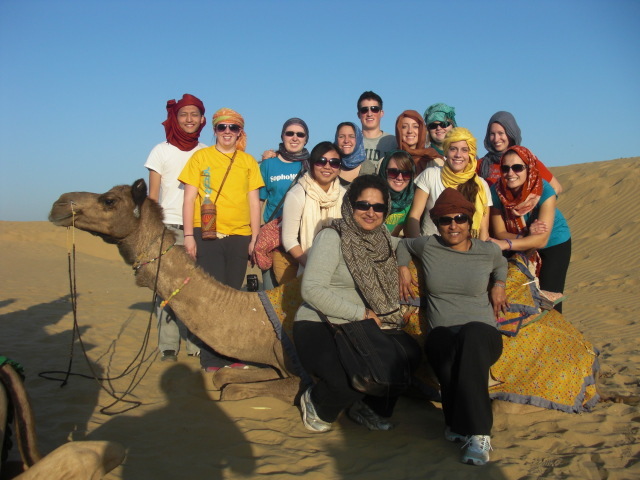 We took a camel ride in the deserts not far from Jaisalmer – it was a blast! 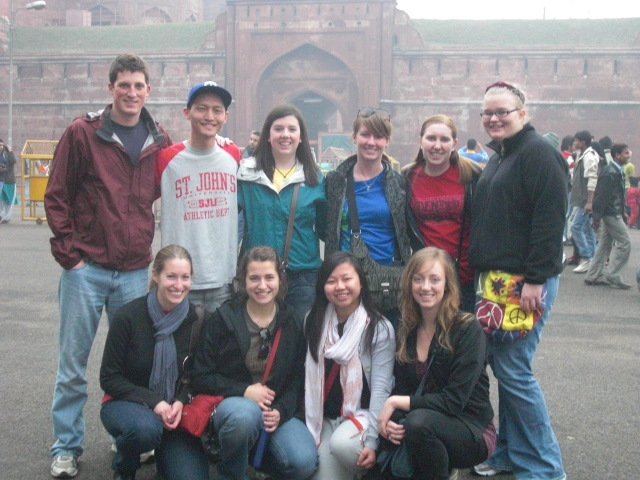 We’ve just arrived back in Delhi, and tomorrow we will be going to Agra to see the Taj Mahal! 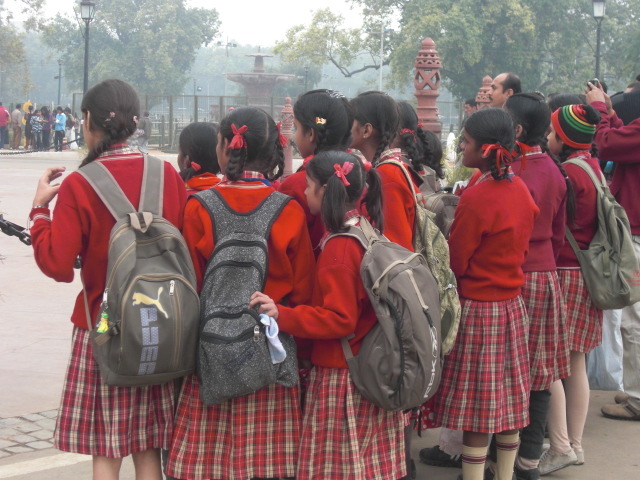 :) After that, we’ll have one more day in Delhi before we head off to Kolkata. I should be settled in with my host family by Saturday night. I’m looking forward to being settled instead of constantly on the go and doing the obvious tourist things. It will be great to see where I’ll be living for the next 4.5 months! Sorry if this post has been a little all over the place, but it’s difficult to process all that has happened the past week, and even harder to put it into words! and – Happy New Year! 2011 is off to a great start!